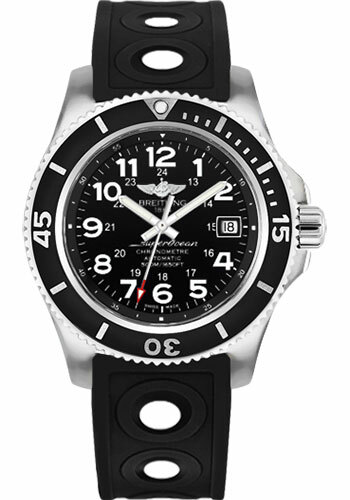 42.00 mm stainless steel case, screw-locked crown with two gaskets, unidirectional ratcheted bezel with black rubber insert, cambered sapphire crystal with glareproof treatment on both sides, Volcano black dial, selfwinding mechanical Breitling 17 movement with date display, 40 hours of power reserve, black Ocean Racer II strap with tang-type buckle. Water resistant to 500 m (1,650 ft). 42.00 mm stainless steel case, screw-locked crown with two gaskets, unidirectional ratcheted bezel with black rubber insert, cambered sapphire crystal with glareproof treatment on both sides, Volcano black dial, selfwinding mechanical Breitling 17 movement with date display, 40 hours of power reserve, marine blue Ocean Racer II strap with tang-type buckle. Water resistant to 500 m (1,650 ft). 42.00 mm steel case, 13.30 mm thick, screw-locked crown with two gaskets, unidirectional ratcheted bezel, cambered sapphire crystal with glareproof treatment on both sides, volcano black dial, Breitling 17 self-winding movement with calendar via dial aperture, approximately 38 hours of power reserve, blue ocean racer ii strap, tang buckle. Water resistant to 500 m (1,650 ft). 42.00 mm stainless steel case, screw-locked crown with two gaskets, unidirectional ratcheted bezel with blue rubber insert, cambered sapphire crystal with glareproof treatment on both sides, Mariner blue dial, selfwinding mechanical Breitling 17 movement with date display, 40 hours of power reserve, black Ocean Racer II strap with tang-type buckle. Water resistant to 500 m (1,650 ft). 42.00 mm stainless steel case, screw-locked crown with two gaskets, unidirectional ratcheted bezel with blue rubber insert, cambered sapphire crystal with glareproof treatment on both sides, Mariner blue dial, selfwinding mechanical Breitling 17 movement with date display, 40 hours of power reserve, marine blue Ocean Racer II strap with tang-type buckle. Water resistant to 500 m (1,650 ft). 42.00 mm steel case, 13.30 mm thick, screw-locked crown with two gaskets, unidirectional ratcheted bezel, cambered sapphire crystal with glareproof treatment on both sides, mariner blue dial, Breitling 17 self-winding movement with calendar via dial aperture, approximately 38 hours of power reserve, blue ocean racer ii strap, tang buckle. Water resistant to 500 m (1,650 ft).